I just returned from Ischia yesterday and while my memories are still very fresh, I wanted to write the post about this beautiful island asap. Ischia in October is wonderful! During these 4 days of amazing food, sunshine and pure happiness I managed to explore a lot of the “Isola Verde” with Imperatore Travel (massive thanks for bringing me there!). Since my 4-day itinerary was perfectly planned and executed by locals, I feel like it couldn’t have been any better. So let me tell you a bit more about the island and the trip. I haven’t met any people in the entire world, who didn’t like Italy. To be honest, I doubt that they even exist. It’s impossible not to like this country with its amazing food, great weather and rich history. Ischia, in my opinion, has the best of Italy with the only difference – it’s not that crowded, especially in October. The population of Ischia doesn’t exceed 60-70,000 people, so in October, when most of the tourists are gone, you can enjoy emptier roads, beaches and cheaper hotels. The temperature in Ischia in October is still very warm – around 22-24 degrees. You can still swim in the sea, but many hotels also have heated swimming pools. When it’s chilly in the evening (after sunset), you can still swim in the pool and don’t feel cold at all. Another reason to go to Ischia in October – the prices. 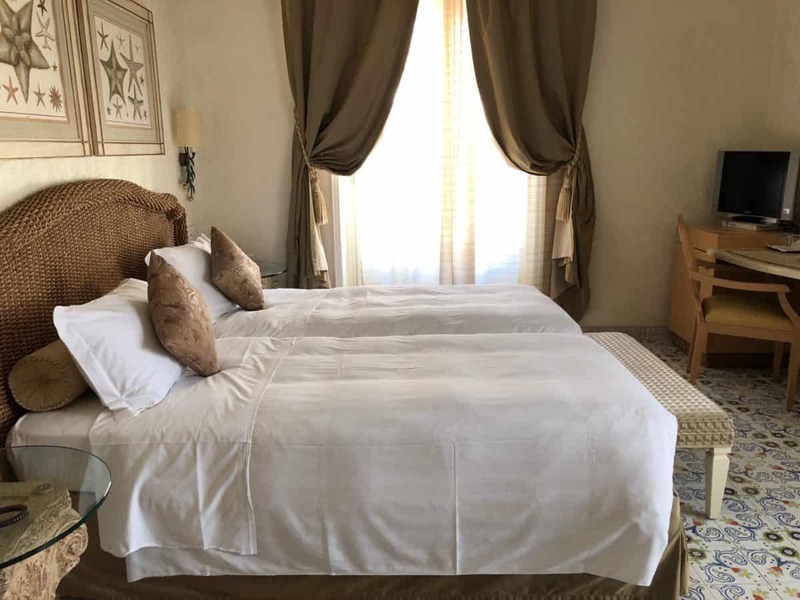 Since October is the last month of the tourist season (most of the hotels, local businesses and restaurants are closed from November to April), the hotel prices are way lower than in August (the most expensive month) or in September. That means that you can enjoy luxury for less! As I already mentioned above, I was invited by Imperatore Travel as part of the FAM trip to Ischia and explored the islands with their kind help. Pepe didn’t go this time, and that explains the lack of my portraits from Ischia on my Instagram @lizatripsget. However, that also means that there are more landscapes and food photos. Yes, food. 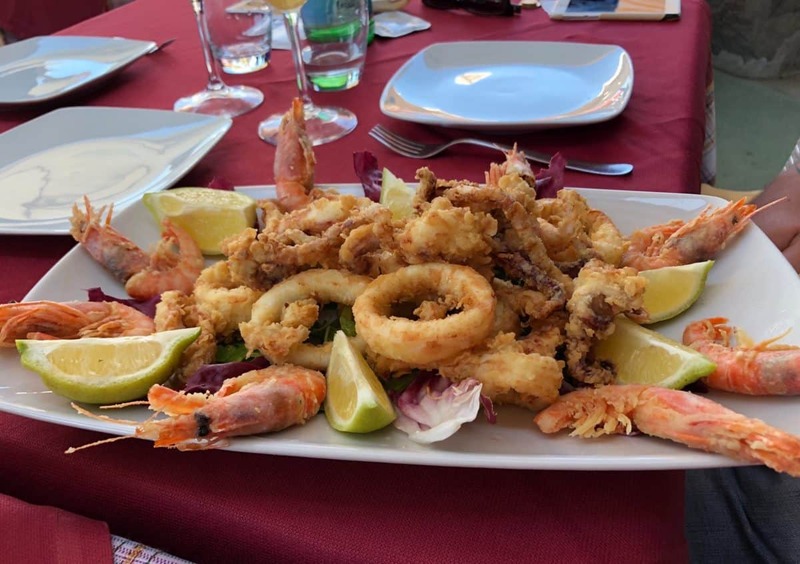 The food in Ischia was literally the best food I’ve tried in the entire world out of 57 countries I’ve visited so far. The freshest possible seafood, locally grown vegetables and fruits and the tastiest homemade bread. Isn’t it heaven? Food in Ischia deserved a separate post for sure. Ischia suffered an Earthquake earlier this year, but only a quarter of the island was affected, so in case you’re wondering, whether it’s safe to go there and whether another earthquake could happen anytime soon, I must tell you that anything in the world is possible, but the last big earthquake in Ischia prior to the one in August happened in 1880-s, so that pretty much speaks for itself. To be honest, I didn’t see any consequences of the earthquake in Ischia at all. In order to get to Ischia, you need to fly to Naples, get to the ferry terminal and take a ferry to Ischia. That’s it. Doesn’t sound very complicated, but I must admit that it’s very time-consuming. Needing to be in London Gatwick by 12:30 I left home around 11 am. At 8:20 pm we took the ferry to the island and it was already 9:30 pm when we got to the hotel. So when choosing the length of your trip to Ischia, take into account a really long commute to the island. You can also fly to Rome and take a train to Naples. There is no airport in Ischia, so you will need to take a ferry. As told by locals, people mostly come to Ischia for 3-7 days. This is enough to see the entire island, try local specialities, relax in multiple thermal parks, visit the famous castle and take a couple of boat trips/excursions. My itinerary included 4 days – but only 2 full days in Ischia, so this was more like a long weekend trip. My itinerary was also pretty intense, so you can perfectly spread it over 5-7 days adding maybe a few extra things to do on the island. On the first day, I took a flight at 2 pm from London Gatwick and only arrived at the hotel Garden & Villas around 9:30 pm. 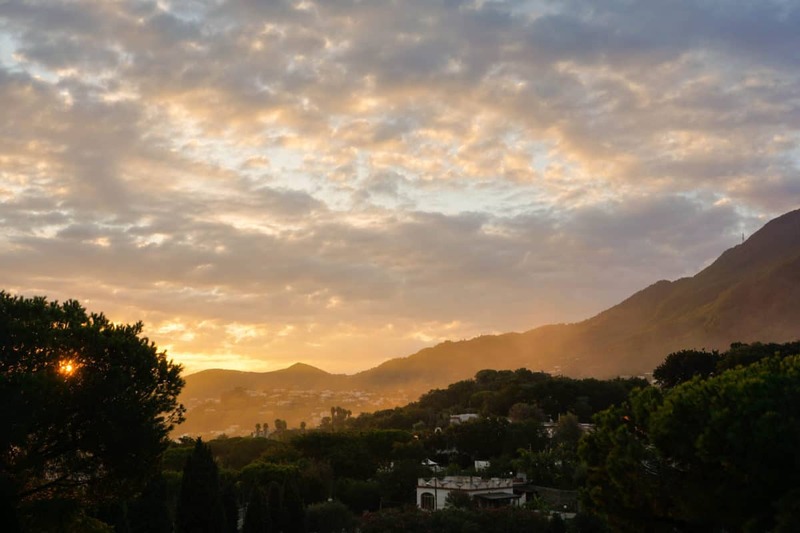 Garden & Villas is the best-rated hotel in Ischia and I can see why. Friendly staff, great location, delicious food, 2 swimming pools (one of them a headed outside pool) and the best sunrises ever. I wholeheartedly recommend staying at Garden & Villas, however, if you want to stay there, you need to book in advance. You can either book directly from the website of the hotel (which is often cheaper) here or check it out on Booking.com here if it’s more convenient for you. 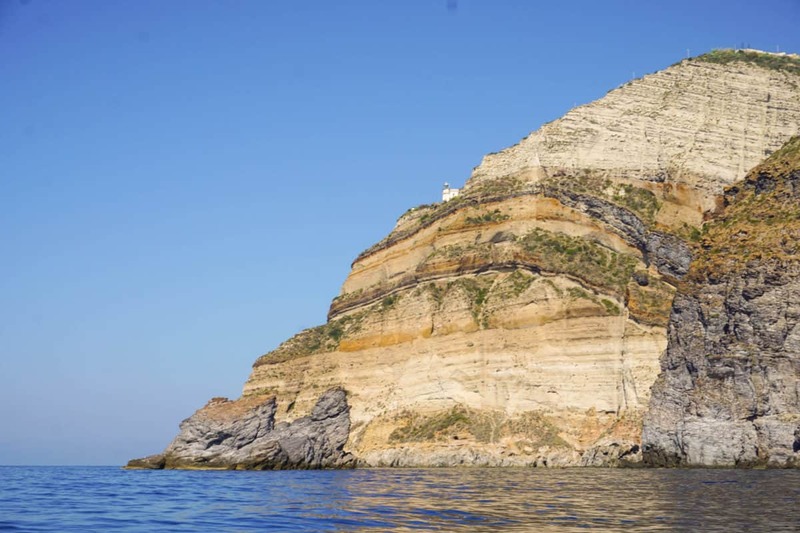 On the second day, I went on a 3-hour private boat tour around the island with Imperatore Travel (sunglasses and a hat are a must, don’t repeat my mistakes!) and afterwards had a delicious lunch at the restaurant La Bussola. 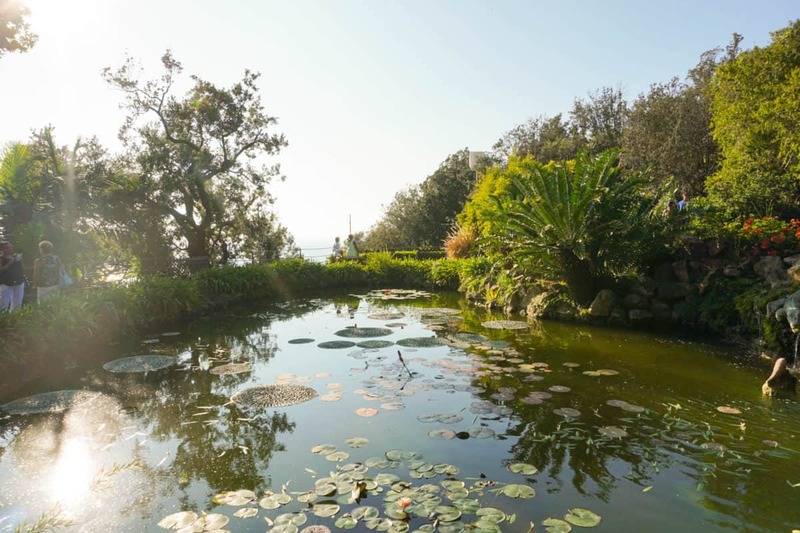 After the lunch, I headed to the most beautiful garden of Ischia – Giardini La Mortella. Afterwards, there was an incredible dinner at the restaurant Montecorvo – it’s hard to get there (you need a taxi) and an advance booking is required, however, you will taste the most delicious rabbit in your life in a very nice atmosphere. 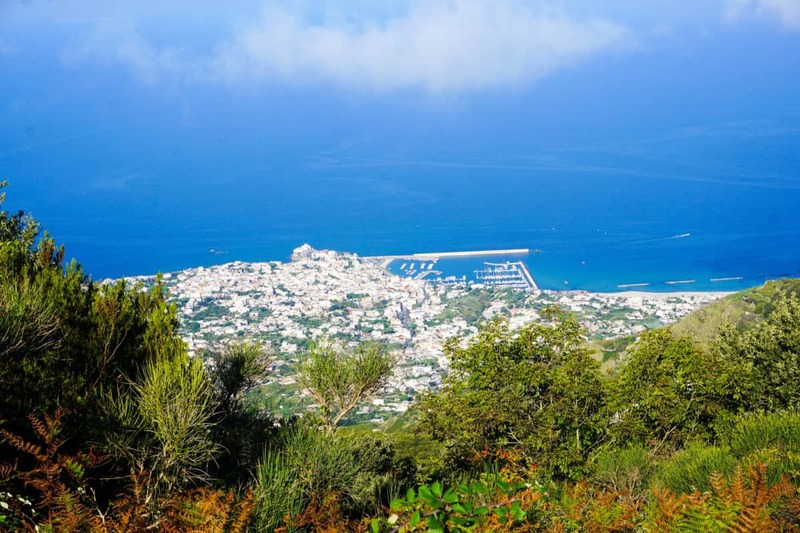 On the third day, I went climbing the Epomeo mountain – the biggest mountains of Ischia. In October, it can be pretty chilly on top of the mountain, so either a hoodie or a light jacket are recommended, but the views are definitely worth it. 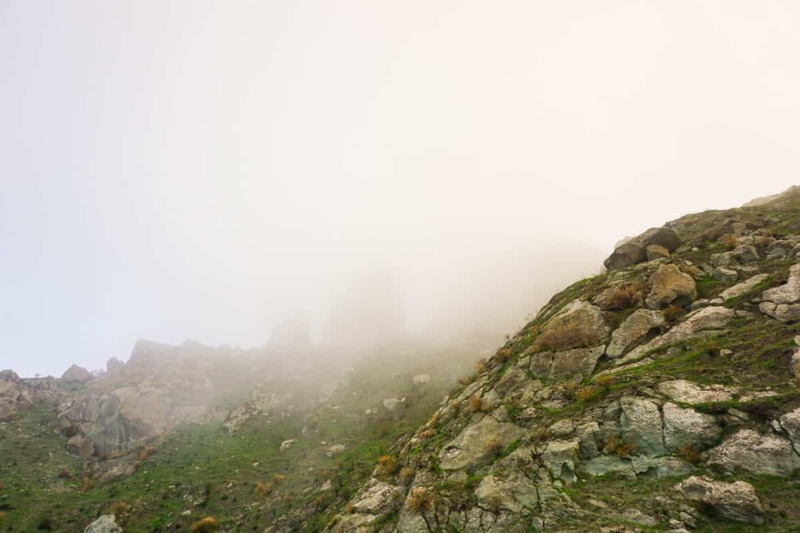 There are several routes you can take – from the easiest one (30 minutes walking) to the hardest one (5 hours and counting). My route was around 2.5 hours in total. Later on, I visited a gorgeous hotel Terme Manzi – it’s a truly luxurious hotel and the spa zone looks really fantastic! If you like luxury, you can check the prices and the availability here. After the lunch in one of the Terme Manzi’s restaurants prepared by a Michelin-star chef, I went to explore the Aragon castle and enjoyed the views from the top of it. The day finished with an impressive dinner in the Restaurant Casa Celestino in San Antonio. In the morning, as always I had a delicious breakfast at Garden & Villas, where I was staying and then I went to the Poseidon Terme – the largest thermal park in Ischia – with 20 pools with various temperature and of course, thermal water. While the park was awesome, the staff was quite unfriendly and rude, so that spoiled the great experience at the Poseidon Terme. Later on, I had a transfer to the ferry and then a flight back to London. To summarise, I would definitely visit Ischia again. It’s such a gorgeous island with amazing food and atmosphere. It’s quite pricey too, so it makes sense to go there once you have a good sum of money in order to enjoy the island the most. However, you can also enjoy the island on a budget, if you go there off-season (e.g. November). I loved Ischia in October and I would definitely recommend you to visit it in September or October. Should you have any questions, please don’t hesitate to ask. Looking forward to reading more about Italy? I have posts about Rome, Bologna, Venice and South Tyrol (Dolomites). 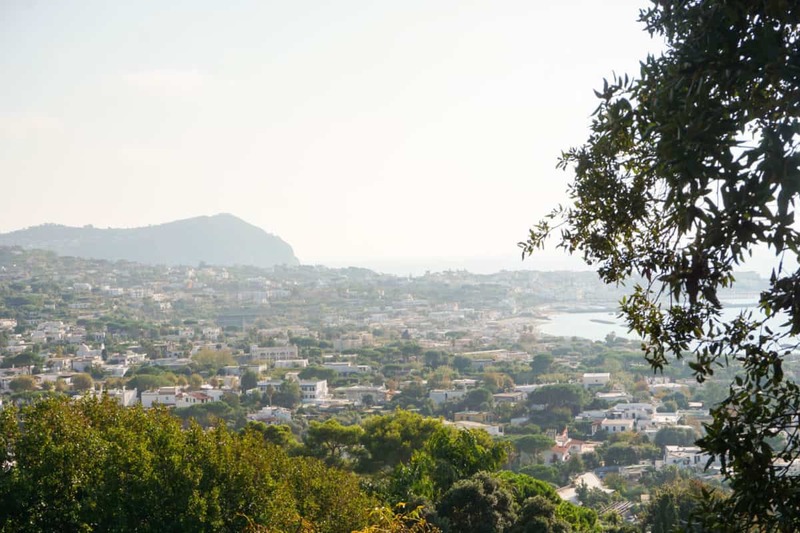 Or check these paperback guides to beautiful Ischia! 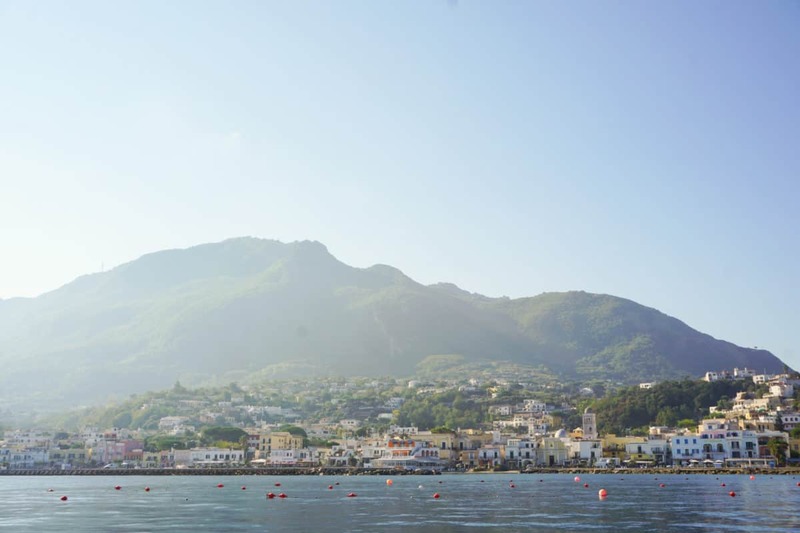 Liked this post about Ischia in October? Share it on Social Media! It sounds as if this time of year is ideal from travelling in Ischia. I haven’t been there but love the food and landscape photos you’ve posted.